Hera couldn't care less what the other gods think, even when it's about her. And it often is. Frankly, Hera couldn't care less about anything, except doing her duty as queen - protecting order and defending the mortal world against any threats. But when the Fates go missing, Hera and a handful of other gods must temporarily become mortal to search the human world for the missing goddesses. Hera finds that mortality begins to change her. It's not just the loss of her divine powers. She expected that. It's deeper somehow. It's affecting how she thinks, how she feels, what's important to her. And it gets much worse after she meets Justin, who defies every prejudice she once had about mortals. At the worst possible time, and despite all her efforts, Hera's black-and-white world starts to unravel. Torn between who she's becoming and who she needs to be in order to fulfill her duty, Hera must survive a horde of murderous creatures sent to exploit her new weakness. 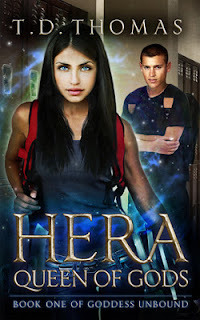 In the end, only Hera can stop a traitorous plot conceived by a secret alliance of ancient and new enemies, a plot that threatens to destroy not only the order Hera is sworn to protect, but all of existence itself. First things first I must say that I am surprisingly impressed with this book. Initially I jumped on the bandwagon because it was about Greek Mythology. Me being a lover of all things Percy Jackson I love Greek Mythology. Problem was just as I was about to read it I noticed how much I had to read. Over 600 pages! Then I started dreading having to read this whole book. It was going to take forever... But, as I started I knew almost right away that this was going to be a faster read than I thought. It reads as fast as regular reads especially with all the fight scenes occurring. When you start getting into the meat of the story all there is, is battle after battle. No, boring fake battles where it's mostly talking. Stuff goes down. I don't really understand why they needed to turn into teenagers but there they were. It also made no sense how only one person noticed and also tried to figure out why they were so different. There would have been even more trouble if one of them was dating anyone. There is the one boy who really takes notice in the change of their attitude. After their stunt in the cafeteria it became obvious that they weren't the same. Hera used the one ability she could take to earth in her human body with her and made a jerk out of the school's...jerk. You can't look at her eyes because then she has you. It's like a sort of hypnosis thing but worse because she can invade your mind and see your deepest darkest secrets if she wanted to. Her ability is key to the whole story and it's pretty amazing. Justin, is the boy who keeps staring at her like her movements hold the secret of her change. He doesn't stare at the other goddesses just her. Justin proves himself time after time. Trying so hard to protect Hera but also giving her space because he knows she's not the type who wants to be protected. That's a guy who knows how to treat a woman. Their romance was tentative and had it's struggles what with monsters attacking all the time but also because Hera is not that girl. Zeus has cheated on her countless numbers of times. It's something that has brought her great pain that has built up to anger which gives her power. Everyone always turns to her, not Zeus, when a big decision needs to be made. What to do next? Let's look at Hera. She must know what to do. I felt Hera's frustration after a while. Learn to help yourself people. Anyways she's not a cheater but the more she struggles with her growing feelings with Justin the more she can't stop thinking about him. Justin was always looking after her and never really gave up on her. You might think he's just s third wheel with all that power coming from the gods but he gets his own power too. Power that tries to consume him. I loved the Dream World and the idea of it too. I loved that humans had more power there depending on their personality. I didn't see what happens there coming. It was a great addition to the story. It was a point in the story that everything shifted for the characters and it wasn't the first time either. Artemis and Demeter are her best friends. I don't think I've mentioned it ever before but Artemis is my favorite. I loved them both. Artemis always protecting her friend but doing the same thing Justin did - giving her some space to do her own thing. I wonder why Zeus never got how to treat her. He's all bronze and no brain. He just crashes into everything and after awhile you think what on earth was he thinking? Nothing. He just does. He also flirts with some girls. I think that was the ability he brought down. He could charm any girl. Yeah, no it was most likely he's strength he brought down. Didn't like Zeus in this story. His best friend is Athena. You know the one that came out of his head? Hera does not like Athena. There are like sides between them. The gods usually pick to be behind Zeus or Hera. They aren't really even in a relationship. I don't see it. Basically everyone comes up to her and says her husband is a dog and she should be with Justin if she feels like it. But she's faithful so blah blah blah. I would have left that man a long time ago. I've never liked Hera. She's always trying to mess with Zeus's kids which I understand but they did nothing but be born. I mean look what she did to Hercules. I think she made him crazy and made him kill his wife and kids. That's going too far. She's never made a good impression in the Percy Jackson series either. But finally I can say I sort of understand Hera better. At least the way she is here. It was nice to see her mortality showing. You could feel the weight she carried inside her. Always trying to do the right thing. You could feel her pain and anger. You could feel her love... Hera has me impressed. I'm also impressed with the author for letting me see her side in everything. I actually like her now. What finally happens with Justin and her was crazy. I don't even know exactly what happens myself. It was a little fast in the end but satisfying. I know this is a series so I'm really wondering if it will continue on with her or another god. I'm kind of hoping her but given the end I doubt it. This was a great book if you like reading about Greek Mythology and want to see other sides to the gods and goddesses. This book sounds like a lot of fun! I love the Percy Jackson series- so this sounds like a book I could really get into. I am not a big fan of Hera either- so I am curious to see how I feel after this book. Great review! You will be surprised. Hera's a whole lot better in my mind. Greek mythology is so interesting, I bet I would like this one. Thanks for reviewing it! Awesome, glad to see another greek myth fan. I loved this book. There is another book being written but the author said it would be about a year. I can not wait! I also loved the dream world and what it added to the story. On the Zeus front I wanted to reach through the pages and smack him. Didn't like him at all. OMG! Zeus! At least he wasn't as bad as he could have been. Left alone he probably would have fallen in love. I haven't ever heard about this, but it sounds like a good read, and something I wouldn't usually pick up. Also, I had no idea Percy Jackson involved Greek myths! Really? Their parents are Greek Gods and later on in the new series Riordan adds Roman gods into the mix. You must have never read it... *gasp* You need to read them.